This campsite is blissfully quiet. The tweety birds are making some noise other than that I'm happy to lie here on my thin airbed and let my thoughts roll around inside my head. Sharon has decided that we actually need to go somewhere and see something as opposed to wandering aimlessly which is what usually happens. 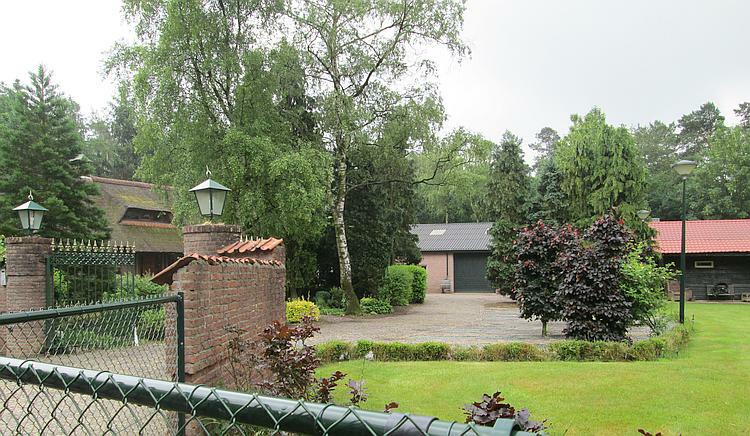 As such we are heading to De Hoge Veluwe, a national park thankfully only 40 or so miles away. All is calm and peacful this morning. Why thankfully? We're motorcyclists, we're bikers, we're two wheeled adventurers roaming around and exploring, we are supposed to like riding motorcycles not look for the shortest route. We've made that mistake before, trying too hard to see everything, to be the great adventurers, racking up big distances and measuring success in miles not smiles. If you like huge distances then good for you, we want to travel slowly, take our time, see the places we pass through and stop a while to appreciate them. Also it makes the inevitability of being lost seem much less of a problem. If time is on our side then being lost often turns out to be a good thing. It's raining. As I start to pack a slim elderly gentleman enquires with a Dutch accent about our plans. I'm happy to talk as Sharon is being a woman and doing whatever it takes women so long to do in the morning. My new friend is retired and taking a break with his wife in their caravan a few metres away. I enquire as to the places he'd recommend visiting, he gives it some thought and before I know what's happening I'm standing in the doorway of their caravan while his good lady puts together a suggested places list. There is no substitute for local knowledge. As we start to pack the rain gets worse. My elderly friend returns with a plate upon which lay 4 discs of some strange looking biscuity things. "Stroopwafels" pronounced "Stroop vaf-fels" apparently. With great trepidation I politely take one and place it nervously into my mouth. Oh dear. Oh deary deary me. Oh heck. This man obviously works for the Dutch vaf-fel mafia and goes around getting poor innocent tourists addicted to these "vaf-fels". Essentially they are a very thin waffle perhaps 2-4mm thick and infused with caramel like syrup. More! Gimme more!! Just before we take the tent down the heavens open with such force it is as though we're in a sea storm. Our friendly caravanners watch in horror as we are pack the tent then insist we must have a hot drink before we depart. We can barely talk to each other over the noise of the rain crashing into their caravan. We sit under their canopy and drink our tea as the worst of the deluge abates. We learn they are in their 70s, they both look very healthy it must be all that Dutch cycling. As we talk 2 more stroopwafels arrive and I guzzle them down. It's raining so hard the camera shows the proverbial "Stair-rods". Great. The respite is just what we need. The rain returns to ordinary rain and we must bid our farewells to these friendly folks. I have my list of places to visit, I have hot tea and stroopwafels inside me and we have talked with this delightful couple. We must depart, we don't want to outstay our welcome. I thank our hosts though it feels hollow, how do you thank someone "more"? These are the beautiful moments that make travelling valuable, the interactions with people, the little acts of kindness and just peeping briefly into someone else's life. Thank you seems insufficient. 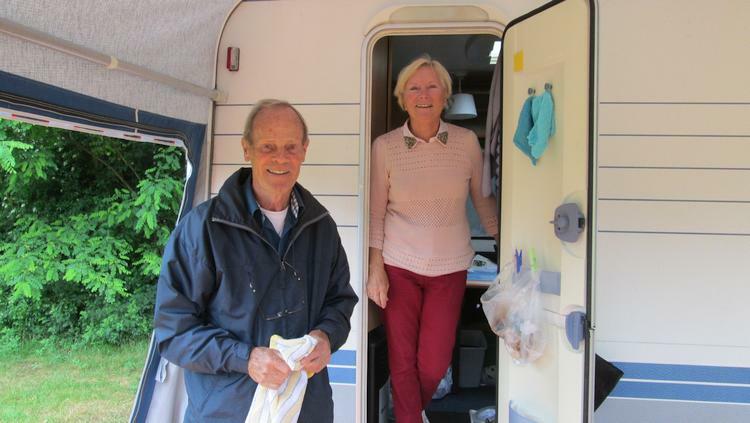 Healthy, happy, helpful and fabulously friendly, our thanks to the Dutch caravanners. Being on the road today is a little easier. I, hopefully we, are learning to adapt to the peculiar Dutch roads, signs, rights of way and cyclists. In truth the complexity of the junctions and the ever present chance that a cyclist may randomly appear requires us to concentrate and this is a good thing, it's all to easy to become complacent and reckless. Admittedly the roads in the countryside are much less demanding than the towns. I do manage to get lost once more. I have been following signs but just like the UK it seems Dutch signs can just vanish. We find ourselves down a single track lane next to a lovely large house with neatly trimmed gardens and perfectly painted railings. Ahead lies a very smooth track covered in gritty sand. Unfortunately the tablet's map suggests this track will bring us out exactly where we need to be in approximately 1 kilometre, but after the upset of Sharon dropping her bike on the way to the ferry I do not think taking her "off road" will be a good idea. The don't do "unkempt" the Dutch. I can't work women out. She was upset after dropping the bike, anyone would be. She's been nervous around any dubious surfaces which again is fully understandable. Now, now she assures me that as long as I don't go speeding off motocross style then lets just take the blooming track. Go figure, but we're taking the track it seems. "Speeding off motocross style"? My off road skills are as good as my knitting skills and I can't knit. OK yes I have ridden a few trails but that only served to reassure me I am useless off road. Luckily the sand is wet from the rain, firmly compacted and rut-free. I progress carefully until I reach a large puddle beneath which the sand is softer, I slither across, feet out. Nervously I check my mirrors to see Sharon riding through feet up like a Dakar pro. Dammit! The kilometre of trail only contains a few soggy soft patches and we emerge safely intact. The rain has eased now to occasional light showers with a risk of sunshine and we can see the terrain better. It is flat. I knew it would be flat but I wasn't prepared for this level (ha!) of flatness. East Anglia looks like The Alps compared to here. There's a lot of farmland, that's to be expected. There's quite a lot of trees too, lining the roads, in clumps here and there then there's small forests too. I knew the roads wouldn't be anything special. There are some curves, we hardly notice them as on out 125's we're keeping ourselves to 50mph (80kmh). Tailgaters are a problem though. I know and appreciate we're going slower than the posted 100kph (62mph) limit but is there really any need to be quite so close to Sharon? We're trying our best and no doubt we'll be out of the way soon enough, they can't physically push us to make us go any faster. In the towns we are moving at the speed limit and yet they're still there, right on Sharon's tail pipe. Perhaps it's a Dutch thing? Kootwijk is a small and pretty village, I'm reminded of a Cotswold village in a Dutch style. The Restaurant De Brinkhof is open so we stop in for a milkless brew and to relax. There is, dare I say it, sunshine trying to warm it's way through the clouds. I'm much more at ease in myself because we do not have big miles to cover therefore no pressure to be somewhere. The tea is hot, the weather is better and I'm comfortable in this chair. Come on let's get a brew! I set out on this trip to see if the Dutch are friendly. I notice that as I look around if I catch another patron's eye they say hello rather than look away quickly as we reserved Brits would do. For several months perhaps almost a year I've been trying this back home. Even in the UK the act of just subtly smiling at anyone nearby has been a resounding success in so much that many folks smile back even if just briefly before looking away. Here the smile is already upon the face of strangers and is often followed with an honest "hello". This seems so natural to them. I like it, they have a good balance of being friendly without being overly familiar. Double drat the rain has returned once more. The gentleman in the booth at the entrance to the National Park is jovial, very well informed and advises us that mathematically it may possibly be just a little cheaper to camp in one of the close by campsites rather than at the campsite within the park. Camping at the park is not expensive, taking the motorcycles into the park is. Between his explanation in excellent English he quips jokes, throws in a weather forecast (it's not good), laughs at our bedraggled appearance and offers directions to several nearby campsites. What a brilliant welcome, despite the rain. 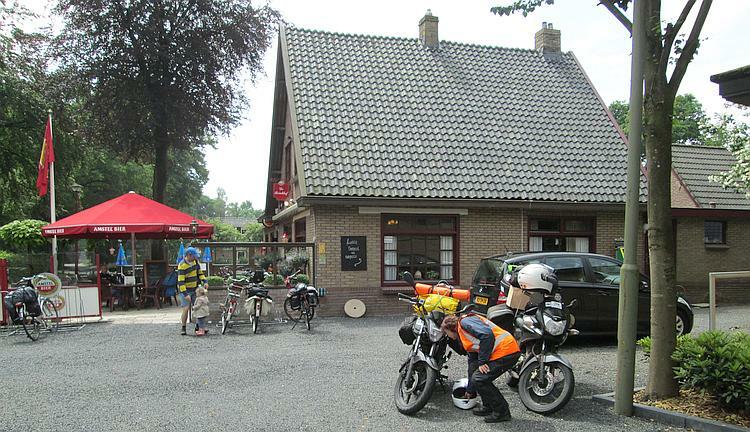 Veluwe Camping Du Pampel is our home for the night. 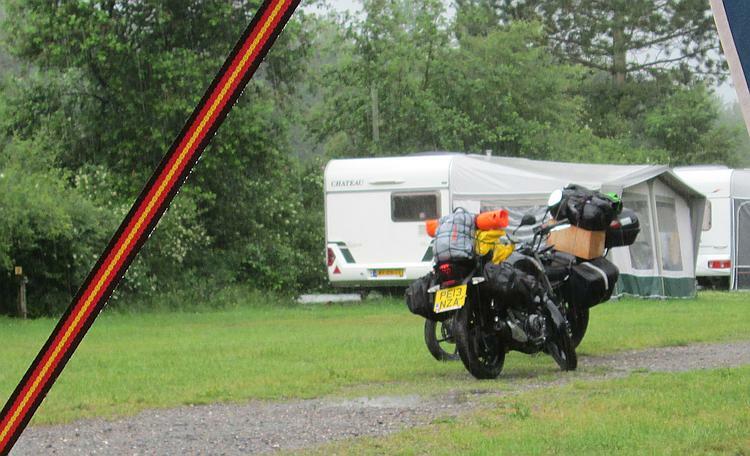 The receptionist seems taken aback by two soggy motorcyclists asking if we can put our tent up and takes a moment to organise herself. Our pitch is nothing special although the toilets and showers are smart and clean. There is a restaurant bar which is closed, a small shop which only opens for a couple of hours in the morning and a swimming pool, again closed. This is becoming a theme, we've experienced similar in France so its not only here in The Netherlands. No matter, while Sharon finishes off sorting the tent out I take a short ride back into town and find a Spar shop to purchase supplies. Oh what to do tomorrow! Tomorrow (Wednesday) is forecast to be wet, Thursday looks better. Sharon wants to have a quiet day tomorrow and sit out the rain then go to the National Park on Thursday when the sun will shine, the skies will clear, angels will sing and peace will befall upon the world. I can understand this logic but I have an issue. If I am to do nothing at all tomorrow then I will go crazy mental loco, I fear Thursday may never come. I get bored easily and I'm no good at doing nothing. 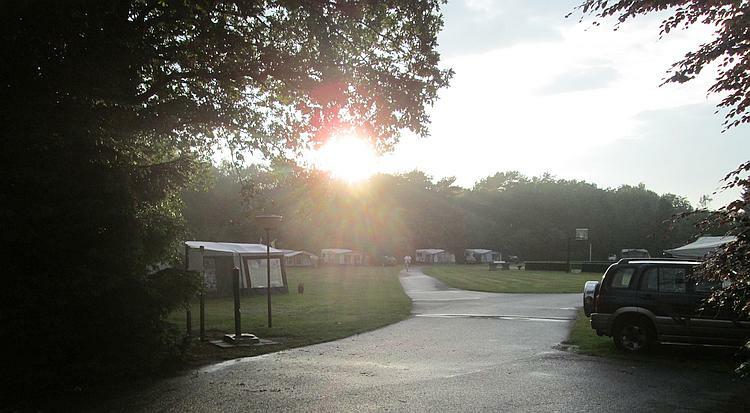 A brief respite in the rain as the sun sets over the trees. We both leave the conversation with a "let's wait and see...".